-This pick is a 100% certainty. The Colts desperately need a franchise QB and Andrew Luck is one of the best prospects to come out in the past 15 years. Luck can start right away and help be a leader on this young team. He has a good arm, with pinpoint accuracy and is very underrated as a runner. Luck should have no trouble adjusting to the NFL as he is already one of the hardest workers, with an impressive NFL IQ. It will only help to have veteran WR Reggie Wayne as his No.1 target. There is no doubt in my mind Andrew Luck will have an immediate impact as a rookie. -How much is a franchise QB worth, apparently 3 1st Round Picks a 2nd Round Pick just to move up 4 spots in the draft. The Redskins gave up their 6th overall, 39th Overall, and a 2013 and 2014 1st Round Pick just so they could move up to No.2 to draft Robert Griffin III. The Heisman trophy winner is a rare specimen that comes around once or twice every decade. He has every skill you could want in a franchise QB; Speed (4.4 40 Yard Dash), Arm Strength, Accuracy, natural leader, and poise in the pocket. 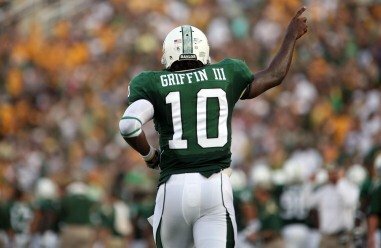 Robert Griffin III is a terrific QB prospect and with more development could be the best QB in this class. -The Vikings have a plethora of needs both on offense and defense, but maybe one of the biggest needs is an OT. At 3 the Vikings have the chance to take one of the most NFL ready LT's in recent memory. Kalil has a big frame (6'7 295) and has impressive athleticism. Kalil can step in right away at Left Tackle and be a cornerstone on that Offensive Line for years to come. As the Vikings prepare for the future with QB Christian Ponder, Kalil will give Ponder the protection he needs. -At 4 there are several different moves the Cleveland Browns could make. On one hand they could address the departure of RB Peyton Hillis by drafting Trent Richardson. They also might consider trading out of 4 to a spot like 8, where the Miami Dolphins would love to move up to get Texas A&M QB Ryan Tannehill. I think what will end up happening is the Browns will stay put, and draft Tannehill in the hopes they can develop him into their QB of the future. Tannehill possesses the raw skills that if developed correctly could make him one of the next best athletic QB's in the league. It is a bit of a risk pick since he can't start right away, but with the emphasis on passing in today's game, the focus needs to be on the QB not the RB. -The Buccaneers had a disappointing season to say the least last year after going 10-6 the previous season, the Bucs dropped to 4-12 in 2011. New coach Greg Schiano will look to make the Bucs a tougher team. Tampa Bay has needs both at CB and RB with Ronde Barber playing at the age of 37 and Aqib Talib continuing to face legal troubles they are in desperate need of a QB. At RB despite some big runs by LeGarrete Blount, there are growing concerns about his attitude and ability to hang onto the football. Adding a RB like Trent Richardson would bring a new aspect to the Bucs offense and give them one of the most balanced in the NFL. I believe the biggest hole is at CB though and because of that the Bucs won't hesitate to pick Morris Claiborne. -The Jaguars are in desperate need of a pass rusher, and they have 2 terrific options in Melvin Ingram and Quinton Coples of North Carolina. Both players have rare athleticism and speed that make them a terror coming off the edge, but what it comes down to for me is consistency. There are questions about Coples work ethic and motor after a very disappointing 2011 season in which he took a lot of plays off. That will likely be the deciding force as the Jaguars will take Melvin Ingram to help piece together their new defense. -Jeff Ireland did a great job of making the QB competition for Matt Moore easier. The Dolphins couldn't bring in Peyton manning, weren't willing to pay Matt Flynn, didn't pay the price for No.2 pick and now may miss out on Ryan Tannehill. If the Dolphins can't get Tannehill they will have to address their need for a RT. Reggie Bush broke out last year and if Matt Moore is still the QB, he will need all the protection he can get. Reiff can step in right away as the Dolphins continue to build their young offensive line. -After taking Cam newton with the No.1 pick last year the Panthers made strides in 2011 and now will look to address the defensive line with the 9th overall pick. Their need for a DT matches with BPA as Dontari Poe out of Memphis continues to rise up draft boards as we get closer to the draft. Poe can be an impact force on the inside, much like Ravens DT Haloti Ngata is today. Poe won't make it past 9 and should be a perfect fit for the Ron Rivera defense. -The Bills went out and addressed their need for a pass rusher by adding Mario Williams and Mark Anderson. Now with that hole filled they can look to address the need for a compliment WR to Stevie Johnson. Floyd has some off the field issues, but at 10 could be a great value for the Bills. Floyd has a big body and strong hands, but has trouble getting off the line. Floyds potential is a great No.2 WR but even now could serve as a nice No.2 for Ryan Fitzpatrick. With weapons like Stevie J, Floyd, and CJ Spiller, life will be made easier for Fitzpatrick. -It is rare when an OG or C goes inside the Top 15 picks, but in the case of David DeCastro he is worthy of being near the Top 10. DeCastro is that rare inside lineman who can be a impact blocker and provide that dominating presence you would want on the O-Line. Coming out of Stanford his IQ is off the charts, and he is also one of the tougher Offensive Lineman in this draft. The Chiefs badly need help on the offensive line and a guy like DeCastro will make running the ball easier for Jamaal Charles and Peyton Hillis. -The Seahawks would like to add a pass rushing LB but with Melvin Ingram gone, i expect them to fill the void at inside linebacker. Kuechly is the type of MLB that will do everything well but nothing spectacular. He can start right away and serve as a steady tackler. While Kuechly has seen has stock rise over he past 2 months, it is still unlikely he makes it into the Top 10. Kuechly would be a strong pick for the Seahawks. -My 1st and only trade in my NFL Mock Draft and it is a big one. I think the Bengals move up from 21 to get RB Trent Richardson out of Alabama. It has become evident that Benson's time is out in Cincinnati and the Bengals will be looking for their next franchise RB. Richardson is one of the most talented RB's to come out in the draft since Adrian Peterson in the 2007 Draft. Richardson's combination of size and speed, to go along with his willingness to block and great hands out of the backfield make him a true workhorse RB. He can go to Cincinnati and form a young trio of stars with QB Andy Dalton and WR A.J Green on an offense that continues to grow and mature. -Jerry Jones isn't known for taking a DB in the first round, especially this year. But look back in 2011, Jones wasn't accustomed to taking OT's in the 1st Round, then they took Tyron Smith. Now in 2012 I expect the Cowboys to take Dre Kirkpatrick out of Alabama. The Cowboys need help in the secondary and Kirkpatrick can pal both S and CB. Any character issues with Kirkpatrick shouldn't be concerned as Jones has learned to ignore those in special cases. -The Eagles would love to take Luke Kuechly at 15 but with the ILB out of Boston College off the board, I expect them to address their need for a safety. After years of struggling to find a duo to man the secondary, the Eagles may finally have their man in Mark Barron. Barron is the top S in this class and possesses the hard hitting Safety they have lacked since Brian Dawkins. -The Jets defense has been at the top for a long time, but if they want to stay there they are going to have to address the need for an OLB. Upshaw can come in and play both DE and OLB and create pressure on the opposing QB's. Once the Jets can create pressure, their defense will be back to the best in the NFL once again. -After trading up from 21 to 13 to get Trent Richardson who was the BPA the Bengals once again go and get the BPA, this time on defense. Janoris Jenkins could have been a Top 10 pick this past season if not for his 3rd drug related offense that led to him being kicked out of Florida. Jenkins went on to North Alabama where he once again dominated. There is no question about jerkins talent; fast, great hands, and a ball hawk, but the questions still remain about his maturity and off the field maturity, the Bengals should and will ignore the red flags and take Jenkins at 17 and fill the need for a CB. An impressive first round for the Bengals, and one that will make them one of the better teams in the AFC. -The Chargers would love it if Mark Barron slid past the Eagles and down to No.18 so they could address their need at S. But with Barron gone, the Chargers will look to address their need for another Pass Rusher. Whtiney Mercilus is an intriguing prospect who possesses speed and elusiveness off the edge. He isn't as developed as guys like Melvin Ingram and Courtney Upshaw but the potential to be one of those guys is there. A development pick for the Chargers, but could be one of the seats in the draft down the road. -Jay Cutler finally has a reliable weapon and it's his old buddy from Denver Brandon Marshall. Marshall who the Bears acquired after trading 2 3rd Round Picks is the immediate No.1 WR in Chicago. At 19, the Bears should look to address their No.2 WR slot and Kendall Wright is a perfect fit. Wright possesses home run speed that would allow Cutler to use the rocket arm that he hasn't had the chance to use as much in Chicago. A duo of Marshall and Wright means Jay Cutler is happy, and the Bears are contenders again. -The Titans liked what they saw out of Jurrell Casey last year and should look to add another inside rusher in the 1st Round. Fletcher Cox out of Mississippi State has a nice balance of strength and speed that allows him to create inside pressure on the QB and also serve as a run stopper. Cox could go in the Top 20 as he has the ability to stop the run and create pressure that defensive coordinators want. Cox is a perfect fit for a Titans defense that continues to grow. -The Cardinals trade back after the Chiefs take DeCastro 2 picks before them, so instead they move down to 21 and pick up a 2nd Round pick in the process. At 21 the Cardinals can still address their Guard issues and not have to reach to do it. Cordy Glenn out of Georgia is a big dude at 6'5 348 lbs and isn't afraid to be aggressive. He uses his strength on the inside to push around and dominate opposing lineman. In Arizona, Glenn can sit opposite Daryn Colledge and give the Cardinals the help they need on the O-Line. -The Browns spent the 4th Overall pick adding their QB of the future, with their 2nd pick (acquired from the Julio Jones trade in 2011) they can find their next stud RT to place opposite of Joe Thomas. Martin is extremely intelligent, and like a lot of Stanford alum one of the hardest working guys at his position. Martin possess the quick feet and long arms that make up the prototypical RT. The only problem with Martin is that he needs to bulk up and just develop as a blocker. Once he can do those things the Browns will be ready with Ryan Tannehill at QB, and two anchors on the left and right side. -The Lions have needs on the Offensive Line, but they can't pass up on an elite pass rusher like Quinton Coples. Coples falls this far because of red flags about his work ethic and motor, both are warranted concerns. But when Coples does give it his 100% there are few better then him at getting after the QB. He would be a steal at 23 and playing with guys like Suh, Cliff Avril, and Nick Fairley would create an unstoppable front four. -The Steelers went out in the off season and cut longtime MLB James Farrior to save money, now they have to find his replacement. Dont'A Hightower is a physical specimen, at 6'2 265 lbs and relishes making big hits, he is the big, tough LB the Steelers love having. He is intelligent on the field always knowing what is going on, and rarely getting out of position. The problem with Hightower is health, and it is a major concern. This late though that has to be pushed aside as a talent like this is to good to pass up. -The Broncos should be looking to bolster their defense at 25 with Peyton Manning now in town, the offense will look better anyways. On defense the Broncos will be likely to address their need at the DT spot. Michael Brockers is a bruiser as a DT at 6'6 305 lbs, he is one of the best run stuffers in the class/ Brockers struggled in 2011 with getting after the QB, and is still a project player. But his upside is off the charts as he could develop into the best DT from this class. -The Texans get what they desperately need, a WR opposite of Andre Johnson. Stephen Hill out of Georgia Tech shocked the world at the NFL Combine and is now a lock for a 1st Round pick. Hill possesses the breakaway speed that is always ready to break one at any given moment. he has strong hands and good size, which make him an excellent option for the Texans and one they will gladly pick. -The Patriots could very likely end up trading this pick for a future 1st Rounder as they do year after year, well this is the year I think they keep the pick. The Patriots could use depth on the interior defensive line and Devon Still is the guy they need. Still can play DE or DT based on the scheme (DE in 3-4 DT in 4-3) thanks to his size and strength. Still can come in right away and give the Patriots the depth they need on the Defensive Line, and help bolster a defense that was one of the worst in the NFL. -The Packers showed in 2011 that their defense can't succeed without a Pass Rush, and with Clay Matthews drawing the double team on every play they are going to need another weapon on the outside. Nick Perry out of Southern California uses his speed and quick first step to get past the opposing tackle and get after the QB. Perry runs a 4.6 40 and at 6'3 has the perfect amount of length that you would want in a 3-4 OLB. Perry is the perfect fit for the Packers and sitting opposite of Clay Matthews could have an instant impact. -The Ravens have to realize that Matt Birk is near the end of his career. At 29 the Ravens can draft Wisconsin Center Peter Konz as their C of the future. Konz already showed in college that he can excel as a blocker, the problem is his ability to snap the ball and get it into the QB's hands. Konz can come in right away and start at Guard (replacing Ben Grubbs) until Birk retires. Until that point the Ravens can help Konz improve his snapping, so down the line the transition from Birk to Konz will be perfect. -It may seem odd for the 49ers to be drafting a TE with Pro Bowler Vernon Davis coming off a big year, but you can never have enough TE's for Jim Harbaugh. While Davis serves as a pass catcher and play maker, Fleener can come in and serve as an extra run blocker, and still excel as a guy who catches passes over the middle. Harbaugh used to coach back at Stanford. Fleener would be the perfect No.2 TE for the 49ers, and would open up the offense more for the 49ers. -The Patriots spend their 2nd 1st Round pick on addressing their need for depth in the secondary. Stephen Gilmore is very athletic who has shown the ability to go up and get the ball, then have the speed to return it. While Gilmore will never be a shutdown corner, he is excellent for a CB at blitzing, and is also skilled at getting off the blocks. He can come in right away and serve as a key piece on the Patriots defense. -The Super Bowl Champions could go two different ways here, address their need for a RB after Brandon Jacobs left for San Francisco, and Andre Brown suspended 4 games or they could address their need for a TE after Travis Beckum and Jake Ballard both suffered Torn ACL's in the Super Bowl. I think the Giants end up going RB and take the electrifying burner in David Wilson. Wilson who dealt with injuries in 2011 is the 2nd best RB in this class. Paired with Ahmad Bradshaw, it would be the perfect match for Wilson, and give Tom Coughlin a new weapon in the backfield. -Arizona Cardinals trade 1st Round Pick (13) and 5th Round Pick (151) to the Cincinnati Bengals for 1st Round Pick (21) and 2nd Round Pick (53). -The Rams have their franchise QB and now have given him a No.1 WR, but it is evident Bradford needs protection. Mike Adams is the No.1 OT on the board and could start right away. -The Colts are certainly going to need more weapons for Andrew Luck, and drafting a Top 10 talent like Alshon Jeffery in the 2nd round is a steal. Even with the red flags playing alongside Reggie Wayne would only help him mature. -After OT, one of the biggest needs for the Vikings is at CB. Alfonzo Dennard once was a projected 1st Round pick, but in the 2nd Round he is to hard to pass for a team that needs all the help they can get. -If the Bucs draft Richardson at 5 this will likely be one of the CB's still on the board, but by taking Claiborne I think Doug Martin becomes the right choice at 25. Martin is a sure handed runner who would be the perfect compliment to LeGarrete Blount. -The Browns are building their offense of the future in this draft, drafting Tannehill and Martin in ROund 1, they now find their No.2 WR to go alongside Greg Little. Randle is blazing fast and could develop into Tannehills' deep threat. -The Jaguars weakest spot is their defensive line, after taking Melvin Ingram in the 1st Round they shift inside to take Jerell Worthy. Worthy is as reliable as they come and will be one of the more consistent players on the team. -The Rams take full advantage of the Robert Griffin trade and address their need for a DT with the 39th pick. Reyes can come in and create inside pressure to help turn this defense around. -As the Panthers continue to address their glaring holes on defense, the gap in the secondary is evident. Josh Robinson is a developmental Corner, but thanks to his quickness and fluid hips he has the raw tools to develop into a great CB. -After seeing Drayton Florence fail in 2011 the Bills are ready to move on. Jayron Hosley is a ball hawk, who can step in as the No.2 CB and take advantage of poor throws with his track speed and athleticism. -The Dolphins have to be looking to find another pass rusher to help take pressure off Cameron Wake. Andre Branch is the next in line of Clemson pass rushers to break into the NFL, and could be the DE the Dolphins have been looking for. -After filling the ILB spot at 12, the Seahawks move right to the outside by taking Lavonte David out of Nebraska. David is the perfect fit for the Seahawks and could help turn the LB core into one of the best in the NFL down the line. -The Chiefs already have a strong defense, two reliable RB's and a talented WR in Dwayne Bowe. The biggest question mark is at QB. Matt Cassell hasn't lived up to expectations, meaning 28 year old Brandon Weeden could be selected in the 2nd Round and start right away. -The Cowboys have all the weapons they need on offense, so they can spend the draft focusing on defense. Ronnell Lewis could step in opposite Demarcus Ware and help make this a relevant defense again. -The Eagles got a steal by trading a 4th Round Pick for Demeco Ryans in March, but they still need more help at the position. Mychal Kendricks can step in alongside Ryans and lift the Eagles D back into the elite again. -The Jets would love to take Trent Richardson in the 1st Round, but if he isn't available they shouldn't pass on Lamaar Miller in Round 2, as they make the transition to a stronger running team. -New England has 4 picks in the first 2 Rounds and if they end up keeping the picks it is likely all 4 are spent on the defensive side of the ball. Vinny Curry is a reliable pass rusher who can play both the 4-3 DE and 3-4 OLB. He can go to New England, come in on 3rd down and help turn around this defense. -After letting Steve Gregory walk in FA, the Chargers need to address their immediate need for a S. Harrison Smith out of Notre Dame could start right away, and form a nice duo with Pro Bowl S Eric Weddle. -The Bears defense is getting up their in age, but one position they still lack is a DT. Brandon Thompson could pair alongside Julius Peppers and help make life easier for Lance Briggs and Brian Urlacher. -After losing Jason Peters to a Torn Achilles a few weeks ago, the Eagles are now in desperation of a OT. Zebrie Sanders is more of a project but could provide depth and still start at RT. -Mike Munchak has made it clear that the Titans Offensive Line play is not acceptable. He will be looking to fix that problem with an immediate starter. Zietler can come in right away and bring the type of play Munchak has been waiting for. -The Cardinals use the 2nd Round pick from my trade to address their need for an OLB and take Zach Brown out of North Carolina, filling one of their biggest needs on defense. -After going BPA in the 1st Round, the Lions start addressing their Offensive Line in the 2nd Round. -The Falcons brought back John Abraham but that doesn't mean they no longer need a Pass Rusher. Abraham is getting up their in age, and Jones could be the guy to replace him. -The Steelers will be looking to address their weakness on the offensive line and Amini Silatolu could be available, even as his name continues to rise up draft boards. -Knowshon Moreno is coming off a serious injury, Willis McGahee is getting old. Bring in Isaiah Pead and the Broncos will have a strong RB core. -Matt Schuab continues to wind up on the sidelines injured and T.J Yates isn't the answer. Nick Yates is the next best thing. 59.) Saints FORFEIT Pick as part of "Bounty Gate"
-Let's hope the Saints learn their lessing about paying players to injure their comrades. -Charles Woodson is getting up their in age and as of now Sam Shields doesn't appear to be the answer. Brandon Boykins could be the answer. -Torrey Smith is stepping up, but after letting Lee Evans go the Ravens need a No.3 WR. Mohamed Sanu is the best WR available and fills a need. -The 49ers lost Adam Snyder to the Cardinals, now they must address that need in the draft. Osemele stock keeps rising and is another great pick. -The Patriots need all the help they can get on defense. Adding OLB Shea McClellin will give them even more depth in the linebacking core. -After filling the RB need in the first round, the Giants get great value with Orson Charles at the end of Round 2.